Every summer we like to spend as much time as possible out in the backyard hosting family and friends, and that inevitably leads to a nice fire later in the evening. We have an old oak tree back there that was struck by lightning last summer and I keep telling myself it would make ideal firewood for those backyard gatherings. There’s enough wood there to last just about the whole summer. All I need now is the right chainsaw for the job. In my seemingly never-ending quest to find a quality chainsaw that’s durable enough to last a long time I came across another great option. 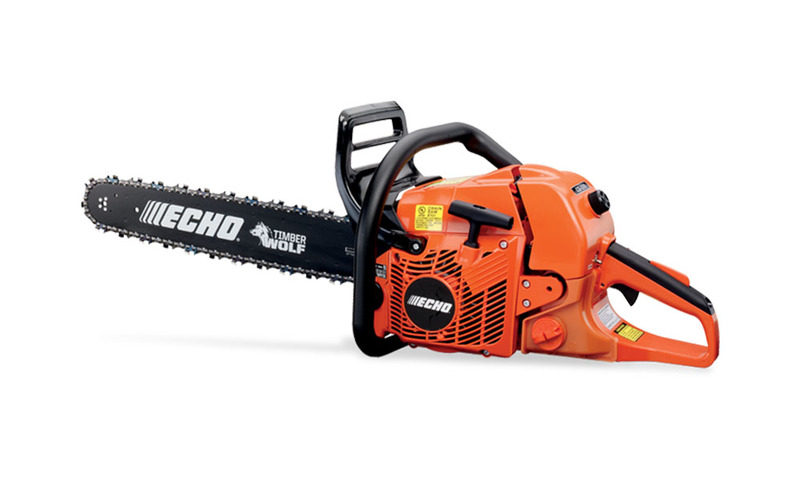 The Echo CS-590 Timber Wolf Chain Saw is a very capable chainsaw, although it’s a brand you may not be familiar with – I know I wasn’t. I always try to keep an open mind though and that’s why decided to take a closer look at this one. This isn’t an entry-level chainsaw by any means, as it will typically cost just under $500. This Timber Wolf chainsaw is a very capable piece of equipment. It starts with the 20-inch blade bar that’s standard on this machine. That’s well above the average of between 14 and 18 inches and makes it ideal to use in both domestic and professional circumstances. There are chainsaws with bigger blades, but this one is up to the task in almost any situation. When you need to use your chainsaw the last thing you want is trouble starting it; this model has some built-in safeguards to prevent these types of problems from happening. For one thing it has a decompression valve which works by releasing pressure from the combustion chamber, making it easier to start the motor when you pull on the starting cord. It’s also equipped with a purge pump for the carburetor that delivers a quick extra injection of fuel to the carburetor to give it the boost it needs to start every time. This isn’t the lightest chainsaw you’ll find at just over 17 pounds, and that will seem a little cumbersome after a little bit of use. When you compare this to an average weight of about 8 to 10 pounds that you’ll find with most electric models, that’s quite a considerable difference. On the other hand, gasoline models can weigh a lot more. There are gas-powered machines that weigh more than 25 pounds, so this one strikes a bit of a compromise between the performance of a gas model and the lighter weight of an electric model. It’s still a fair bit of weight, though, so you will feel it in the arms and the shoulders after a while. It’s important to keep your chain saw well-oiled and this chainsaw is equipped with an automatic oiler to do that for you. This is controlled by an innovative clutch-driven system that’s both efficient and effective. As long as you keep the oil reservoir topped up, you shouldn’t have to worry about too much friction being created as you cut – the oiler will keep the blade and chain lubricated as you go. If you’re going to spend $500 or more on a chainsaw it’s not unreasonable to expect the manufacturer to back up their product. In that sense this product doesn’t disappoint, with a 5-year warranty that far exceeds most other chainsaw warranties available to you on any other machine. It’s pretty reasonable to assume that you’ll know long before that 5 years is up if you’re going to run into any problems with your machine. A powerful gasoline powered chainsaw is bound to create quite a bit of vibration as you cut through wood. That can have a serious impact on your body – especially in your hands and forearms. While this machine doesn’t eliminate the vibrations all together, it does a pretty good job of minimizing them, and that’s a good thing if you plan on doing a lot of cutting with your chain saw. The Echo CS-590 Timber Wolf Chain Saw has an ergonomically-designed handle that will also help to minimize the stress on your body. It aligns naturally with the contours of your body and will make the saw seem like a natural fit. The grip on the trigger has extra padding as well, which will add to the overall comfort factor when using this chain saw. Probably the last thing you’ll want to do when you’re in the middle of pruning the trees in your backyard with a chainsaw is to stop to fuel up. This machine has a fuel tank with a respectable .57 liter capacity. It holds enough fuel to get you through hours of work, although it’s always a good idea to have a fuel tank on hand just in case – especially when you’re still getting familiar with how the saw performs. One of the best ways to learn how well a power tool performs is to read some reviews from people that have actually purchased one. This chain saw has very few negative reviews and that’s a good thing. The few people that did post negative comments were normally frustrated with getting the machine to start, but these seemed to be the exception, not the rule. The Echo CS-590 Timber Wolf Chain Saw is a bit more expensive than some other chain saws we review on this site, but it’s also one of the better ones. It normally starts on the first try, it’s designed to minimize the impact of vibrations, and it has one of the best warranties around. If you don’t mind the price tag, this is one of your best options when you’re in the market for a new chain saw.